This album is about forms of love including compassion, friendship, sympathy, and romance. As I I began final editing on this project, a common theme emerged: one to express the many forms that love can take. The pieces cover moods such as friendship, family affection, joy, sorrow, grief, happiness, empathy, intimacy, and compassion. Since love can bring us up or down, and because it can involve so many areas of our lives, the sequence of the pieces expresses a journey from light through shadows, and then back into the light. 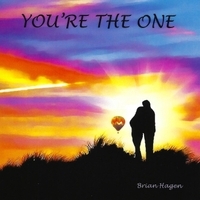 "You're The One" is the fourth release by artist Brian Hagen and has 14 tracks. Tracks 1, 7, 9, 10, 11, 12 and 14 are original compositions. The other seven tracks are classical pieces by several different composers. One thing I admire about this artist is his ability to play a variety of styles from original to classical and jazz. Brian shared with me that during the final recording sessions, a theme for the album emerged though not necessarily intentional. The cover was designed by his fiancée and true love Carly. Many of the tracks tell the story of how love affects people in different ways and his interpretation of that. The album musically expresses the way love can bring joy, happiness, sadness, heartbreak and even grieving. The album begins with the title track, You’re The One. The song is a love story of when Brian and his fiancée met on that first day. It truly was love at first sight, not just a cliché. The sweet and pleasing melody represents that sentiment perfectly and tells of a genuine love story. It was very expressive and coaxes the listener to want more. My next favorite on the album was Nocturne, a piece by Alexander Borodin theme from String Quartet #2. I really loved the arrangement Hagen did of the piece. The dynamics are expressive and precise. The keys at the hands of this skilled artist express a gentle persuasion that lends to a breathtaking musical indulgence. Ended up being one of my favorites as well. There are many classical pieces by various composers included on this enchanting CD, make sure you don’t miss them! Lonesome Road ended up being my absolute favorite jazzy number on the album. I love the combination of the jazz and soulful riffs of this catchy melody. The artist shared with me that this piece represented loneliness he felt at a time in his life and the piano a comforting companion of expression. Loved the trills and the stark intro and ending. Really felt the sentiment and meaning of Lonesome Road. Loved it! Let It Flow was my next favorite on the album. The song represents having sympathy for someone who is experiencing intense grief. It musically captures a moment the artist personally witnessed of a someone he didn’t know openly sharing his grief. The song he said tells the story when you may feel helpless how to respond and the song wrote itself. Very moving and touching melody. What a beautiful moment in time. The album closes with Sunflower and I absolutely LOVED this one! During the improv section of a tune he was performing by Oscar Peterson, Hagen said he began to change the chords and then let the progression flow. This was the magical result. I did love the chords in this one. The intro is bright, and the chords set the tone for a very happy mood for the listener. Couldn’t quit listening to it on repeat. Brilliant! You’re The One is a poetic blend of original, classical and jazz. I found the combination to be very relaxing and colorful. The fusion of these different styles woven throughout just works in the flow of the album. Pieces by composers such as Beethoven, Mendelssohn and Schumann are featured and are captivating. A perfect CD for cheerful unwinding and a welcomed addition to any musical collection. I highly recommend it. "You’re the One" is the third full-length album from pianist/keyboardist/composer Brian Hagen. Like his previous releases, the album is a combination of original piano solos and classical pieces - seven of each. The fourteen tracks are varied and include dreamy love songs, a bluesy piece, original compositions that are happy and sad, and familiar and not-so-familiar classical pieces (some of which Hagen arranged for solo piano). During the recording process, Hagen realized that an unplanned theme was emerging in the music - a theme about the many different ways that love can affect people. The overall mood of the album is one of joy and the happiness that love can bring, whether it comes from a romantic relationship, family or friends. Balancing the emotions, there are also a few pieces that express heartbreak and sadness as well as empathy for a stranger’s grief. Brian Hagen has been playing the piano since he was a very young child. He was classically-trained and studied classical music and jazz as a music major in college. "You’re the One" begins with the title track, a wonderful piece that Hagen wrote to celebrate the day he and his wife met, experiencing love at first sight. Buoyant and light-hearted, it sets the joyful tone of the album. “By the Limpid Stream” by Burgmuller has a beautiful flowing quality that makes me wish it was longer than 70 seconds! Borodin’s “Nocturne” was adapted from his String Quartet #2 and expresses a peaceful contentment that is soothing and relaxing. Mendelssohn’s "Songs Without Words" are some of my favorite classical piano pieces and “Contemplation” is one that I dearly love. Hagen really makes it sing (without words!). The “Andantino” movement from Diabelli’s Sonatina Op. 168 is bittersweet and poignant, tugging at the heartstrings. Hagen’s “Lonesome Road” started out as “some rather scattered piano noodling one night many years ago.” Part pop ballad and part blues piano, it’s a favorite. “Afternoon Waltz” is light and playful. “Let It Flow” has an especially interesting origin. Hagen happened to share an elevator with a teenage boy who had just learned that his grandfather was dying. Trying hard to control his emotions, the young man broke down, shaking with grief. At a loss for words, the encounter ended before Hagen could find anything comforting to say. Instead, he went home to his piano and this piece poured out in just a few minutes. The emotional depth of the music really touches the heart - my favorite piece on the album. “Autumn Afternoon Homecoming” is a smooth jazz piece about the love that family and close friends can share, and was inspired on a beautiful autumn day while thinking about fall treats and hayrides. “Sunflower” emerged while improvising on a piece by Oscar Peterson and expresses an infectious happy mood - a great ending to a great album! I really like the versatility of Brian Hagen’s music and the way he easily moves from classical to jazz forms in both his own compositions and his interpretations of other people’s music. This is a really nice album for active listening and will also do well in the background. Recommended!